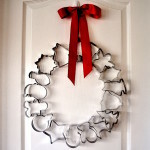 A Christmas wreath is the best type of craft to make at the holidays. 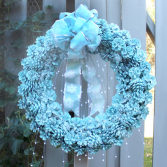 Wreaths can be elegant and glamorous and just about perfect for a house that is ready to welcome the Holidays. Making a Christmas Coffee Filter Wreath is ideal for this purpose, and on top of that, it takes only a few inexpensive materials to make. 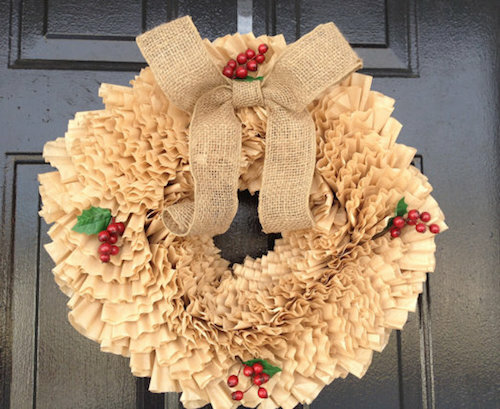 Take a look at how your coffee filters can transform your home for the holidays. 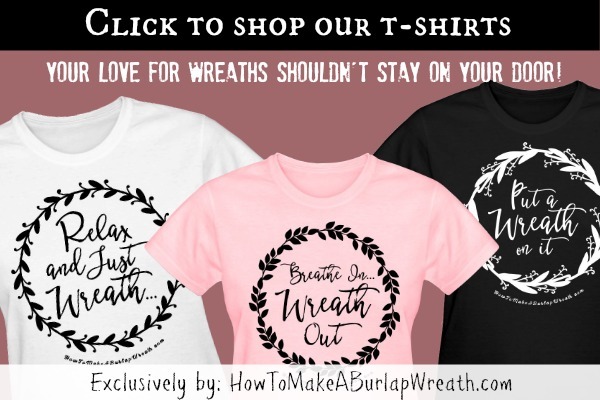 At the end of this post see how this wreath can make a great all year-round wreath to display throughout your home at anytime. Crunch one coffee filter or place a pencil in the middle of it and wrap it around the tip of the pencil. Pinch and twist the pointy end of the filter. Glue the pointy end of the coffee filters onto the foam wreath, by either placing a small amount of glue on the foam or on the filter coffee. Continue gluing crunched coffee filters side by side, until you have completed the first row of coffee filters, making sure to leave a small piece of the foam wreath form uncovered in order to be able to add the ribbon for hanging. Continue with the rest of the rows until you have covered the foam wreath form, but always remember to leave the small piece of the foam wreath form uncovered. 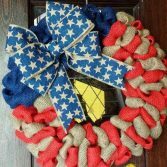 Wrap or glue the ribbon to the foam wreath form. Use some hot glue to glue together coffee filters if necessary, especially if you see some to loosely covered spots. You can use the scissors to trim any excess coffee filters or uneven edges. Add embellishments. 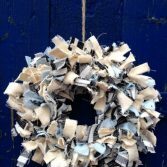 You can glue them directly onto the coffee filters or, for a more secure attachment, glue or attach a wooden skewer onto the embellishment and drive the skewer through the foam wreath. To make Christmas Coffee Filter Wreaths might be a little time consuming, but the finished item is really worth it. 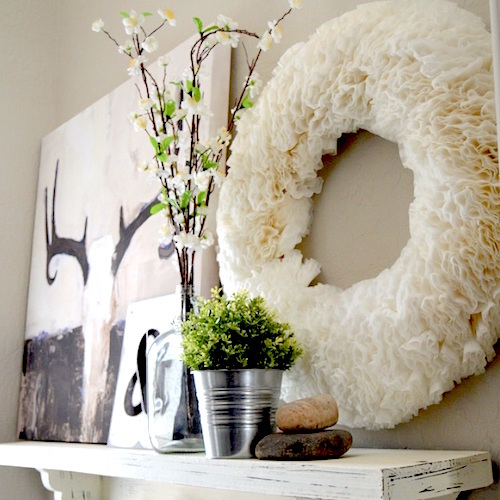 These Coffee Filter Wreaths are wonderful for any time of the year. You can use brown or white coffee filters to make them, and you even can dye the coffee filters and let them dry before using them or just spray paint as a final step. 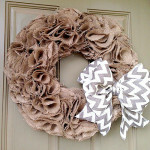 It’s better to hang this wreath inside, since coffee filters are not water resistant. They look gorgeous in front of a window or a mirror, and placing them inside a frame or on a door can make it stand out even more. 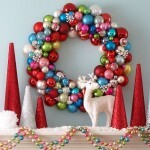 For more creative wreath tutorials, search our All Year-Around Wreaths category! 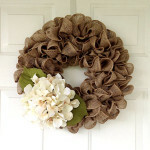 I just love the look of the coffee filter wreath – so pretty! Thanks for sharing with us on this week’s Monday Funday Party! Wow, it looks so gorgeous !! The little red ornaments adds a lovely holiday touch to wreath. Thank you for sharing with us at #HomeMattersParty. We wish you a very Merry Christmas and Happy Holidays !!. We would love to have you again when we are back on Jan 8, 2016.